As I was reading through Angela Maiers post connected to this video, I was drawn to her idea of telling people they matter. 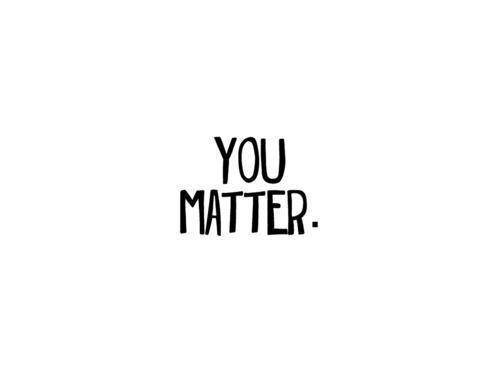 In Angela’s mind, these are two of the most powerful words someone can hear: You Matter. She suggests that we should say them more often to the people who matter to us most. Marina Gijzen….You matter to me! You have been an inspiration since we worked together in Bonn. From you I have learned to be more patient, to realize the power of a child’s mind, to take a step back and look at things from a different perspective, and to seek balance in all that I do. Your thoughtfulness, reflectiveness, and passion are inspiring. Patty Northrop….You matter to me! You are a gift to those around you and an inspiration for me to be a better teacher, a better parent, and a better person. You look for the good in things, you strive to help when and where you can, and you are the very definition of a life-long learner. Your willingness to share, to talk, to discuss, to learn and to grow are inspiring. I am thankful that the technology exists to keep our ideas flowing. Heather Goodman…You matter to me! You would hate me publicly saying how much you matter to me but I am going to do it anyway because, even though I think you knew it, I never got the chance to actually tell you what an amazing educator you were and how the things I learned from you about inquiry, leadership, collaboration, autonomy, and possibility, are things that will stay with me forever. I am so thankful to have worked with you in two different schools, to have worked with you as my colleague, and to call you my friend. There are many more people that matter, are indispensable, are genius. Who are these people for you? They don’t need flowers, champagne, a parade. They do need to feel significant, to know that they matter. Who are these people for you and when will you tell them that they matter to you? The Power Of Noticing is something Angela talks about. How the very act of simply noticing kindness, innovation, expertise, experience, thoughtfulness, and then shining a light on these acts, has the power to create change within students and in your classroom. What will you choose to notice? What matters enough for you to spend your time and energy noticing? This is a good reminder that it isn’t just our students who benefit from us giving them our attention and regard. We set the mood. I have a very warm glow going through me. Thank you, Sonya. You are so welcome. I was lucky to work with you – inspiring! Looking forward to that time that our paths cross again – soon?! I LOVE this! I am going to email it to Bob C right now. It’s is a perfect contribution to our Cultural Committee. I am also going to make sure I do this in my home. Thank you for sharing. I am doing this at home too. The noticing part is so easy and yet so often overlooked.